In the absence of various articles and interviews that are still in preparation, here’s a short mix, concentrating on music from Martinique and Guadeloupe, with a few things from other places thrown in. There’s already been some mention of the Antilles round these parts: the music featured here is later than the pieces on the Tumbélé comp, and generally more percussive. Much of it is based around, or influenced by, the rhythms of gwo ka and chouval bwa. For instant education on the history and meaning of gwo ka, turn to Duke Etienne’s article in the current issue of Shook Magazine (Vol. 1, No. 7) or check out the online companion piece here. The following notes are just a brief introduction to the mix, which at some point I hope to expand. 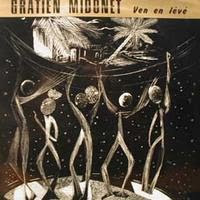 My first meeting with Antillean music was a chance encounter with a Gratien Midonet record, his extraordinary Ven en lévé, the LP from which the track ‘Mari Rhont...’ is taken. Midonet is usually described as a poet, composer and singer. I know of four albums by him: Ven en lévé (1979), Bourg la folie (1984), Linité (undated) and Potlach (2003). Bourg la folie is apparently the music from a film of the same name, based on a novel by Roland Brival. Midonet’s music is a fusion. Some of the other tracks in this mix are far more stripped down, especially those by Esnard Boisdur, Eugene Mona and the Akiyo ensemble. Mona, singer and flute player, died in 1991 and was commemorated in 2006 by a tribute album entitled Léritaj Mona. Dédé Saint-Prix, also a flute player, can be heard here veering towards a sort of raw zouk. These rhythms go back to Africa. Without trying to draw any specific parallels, here are also three tracks from, or derived from, Nigeria, to counterpoint the Caribbean pieces. Agbe De O, by the Sound Millionaires, is a bit of juju-influenced funk, or funk-influenced juju, depending on how you look at it. Jeka Jose is by the percussionist Gaspar Lawal, who was active as a session musician in London in the 1960s and 70s. Shacalao, meanwhile, is a storming version of Fela Kuti’s Shakara, rerouted via Colombia. At some point I hope to expand this sketch with a more considered account of these tracks and their context. But in the meantime, here’s the music. Tambou means drums: read about them here.